St Joseph’s Paul Fabbri (10) looks to pass the ball past Danbury’s Keyon Moore (3). Just 22 seconds into the third quarter, the St. Joseph boys basketball team appeared to catch a big-time break. On the Cadets’ first possession of the period, Danbury’s Denali Burton was called for his third personal foul and went to the bench. With the score tied 23-23 and Burton — the Hatters’ impactful 6-foot-4 senior power forward — out of the game, St. Joseph had an opportunity to take charge of Thursday night’s contest. But when Burton returned more than five minutes later, it was Danbury that had a 36-29 lead. Burton then made up for lost time by scoring the opening two baskets of the final quarter as the Hatters pulled away for a 58-46 home victory. The win was the seventh straight for the Hatters, who improved to 8-2. St. Joseph lost its second consecutive game and is now 6-3. Danbury’s 8-0 run to start the third quarter was turbocharged by a defensive adjustment. 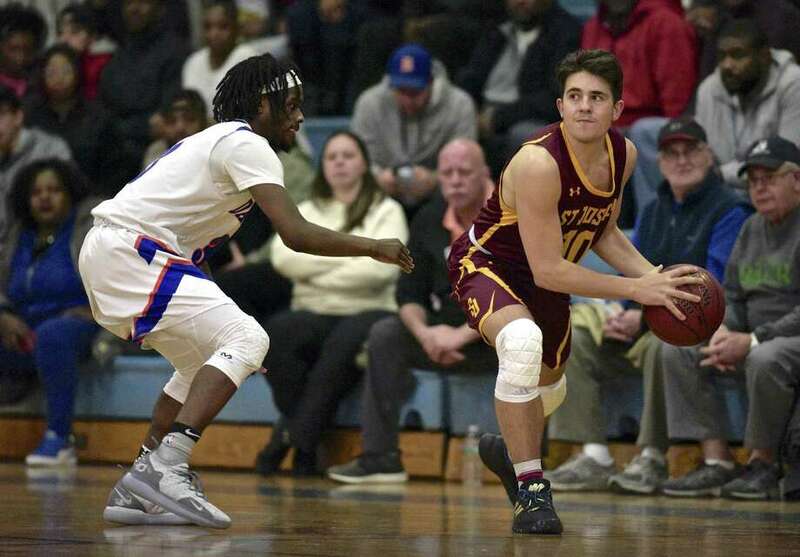 The Hatters came out in a half-court trap that separated St. Joseph from its offensive rhythm, leading to missed shots and a turnover that ended in Keyon Moore’s layup. St. Joseph closed within 36-31 on Dan Tobin’s follow-up basket with under two minutes left in the third quarter. But Javon Hernandez hit a jumper and then swished a 3-pointer from the corner right before the buzzer, sending Danbury into the final period with a 41-31 lead. Burton’s two buckets at the start of the fourth quarter extended the Hatters’ lead to 14 points, and St. Joseph got no closer than eight points the rest of the way. The Cadets played their best basketball in the second quarter. Trailing 14-9 early in the period, St. Joseph got a 3-pointer from senior forward Brendan Kade and a traditional three-point play from freshman point guard Jason James to go ahead 15-14 with 4:35 left before halftime. Burton’s dunk on a nice feed from Jaden Cook gave Danbury a 23-20 lead with 28.2 seconds remaining, but St. Joseph’s Stephen Paolini then powered to the basket for a left-handed layup and drew a foul. Paolini added the free throw to tie the game at the break. St. Joseph: Paul Fabbri 5 3-4 14; Dan Tobin 7 0-0 14; Stephen Paolini 4 1-1 10; Brendan Kade 1 0-0 3; Jason James 2 1-1 5. Totals: 19 5-6 46. Danbury: Denali Burton 8 1-2 17; Josh Joyner 4 1-2 9; Jaden Cook 3 1-2 7; Keyon Moore 3 0-0 7; Javon Hernandez 5 2-2 14; Raimir Rivera 2 0-0 4. Totals: 25 5-8 58. 3-pointers: SJ – Fabbri, Paolini, Kade; D – Hernandez 2, Moore.